The photovoltaic chips are mounted on micro-structured layers that pipe liquid coolants within a few tens of micrometers off the chip to absorb the heat and draw it away 10 times more effective than with passive air cooling. The coolant maintains the chips almost at the same temperature for a solar concentration of 2,000 times and can keep them at safe temperatures up to a solar concentration of 5,000 times. The direct cooling solution with very small pumping power is inspired by the hierarchical branched blood supply system of the human body and has been already tested by IBM scientists in high performance computers, including Aquasar. An initial demonstrator of the multi-chip receiver was developed in a previous collaboration between IBM and the Egypt Nanotechnology Research Center. 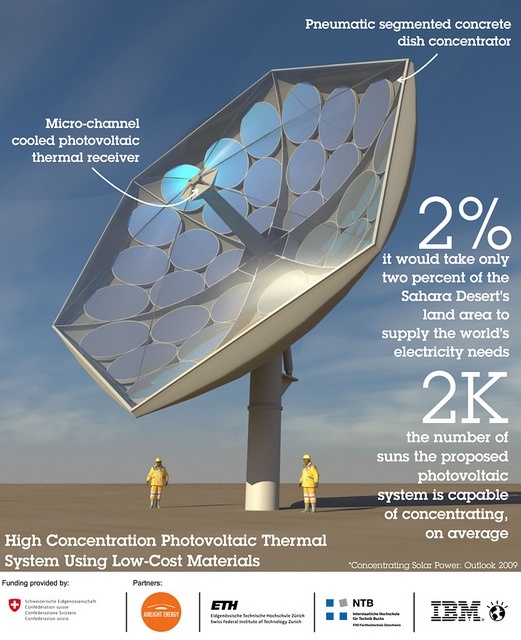 “We plan to use triple-junction photovoltaic cells on a micro-channel cooled module which can directly convert more than 30 percent of collected solar radiation into electrical energy and allow for the efficient recovery of an additional 50 percent waste heat,” said Bruno Michel , manager, advanced thermal packaging at IBM Research. “We believe that we can achieve this with a very practical design that is made of lightweight and high strength concrete, which is used in bridges, and primary optics composed of inexpensive pneumatic mirrors — it’s frugal innovation, but builds on decades of experience in microtechnology. One of the innovations of the new system is its collection and repurposing of the “waste heat” generated by solar thermal. By utilizing the heat instead of simply allowing it to dissipate, it becomes possible to cheaply desalinate water and provide cooling via a thermal-driven adsorption chiller, while also solving the overheating problems of solar chips. In order to efficiently capture the waste heat, the researchers made use of an advanced technology that was already developed and in use, the water-cooling systems for very high-performance computers such as Aquasar and SuperMUC. While that heat is simply reused to provide space heating for the facilities, the captured heat in this instance will be used to heat salty water that is then distiller via vaporization. The researchers say that the system could provide up to “30-40 liters of drinkable water per square meter of receiver area per day, while still generating electricity with a more than 25 percent yield or two kilowatt hours per day.” So with a large array of these systems it would be very possible to provide enough water for a small city/town. Researchers are currently testing a prototype of the HCPVT system at IBM Research — Zurich.